The U.S. Department of Education believes it is important that all programs responsible for pre-service teacher training prepare all graduates to effectively select, evaluate, and use appropriate technologies and resources to create experiences that advance student engagement and learning. We call upon leaders of teacher preparation programs to engage in concerted, programmatic shifts in their approach to pre-service teacher preparation. 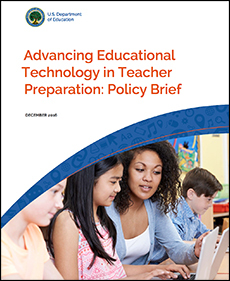 This policy brief identifies key challenges and solutions to the effective integration of technology in teacher preparation, provides guiding principles on how to move the field toward effective integration of technology in teacher preparation programs, and identifies areas of opportunity and collaboration for stakeholders across the field.